All patients wherever possible will have a double lumen tube in situ. Exceptions include mini-tracheostomy, paediatric patients, and tubes with an adjustable flange. The incidence of tube blockage can be reduced by the use of an inner lumen that can be easily removed for cleaning then replaced. Inner tubes may be fenestrated or non-fenestrated. Patient requestIf patients are receiving oxygen consider pre-oxygenation prior to removing the inner lumen. Where possible, replace the inner lumen with the spare lumen to allow continued flow of oxygen to be available to the patients. This is not an exhaustive list and staff must use clinical judgement to assess patient well-being. When using the fenestrated inner lumen please note that the oxygen delivered may be reduced. Only use the inner lumen supplied by the manufacturer to prevent tracheal erosion, and secretion build up. 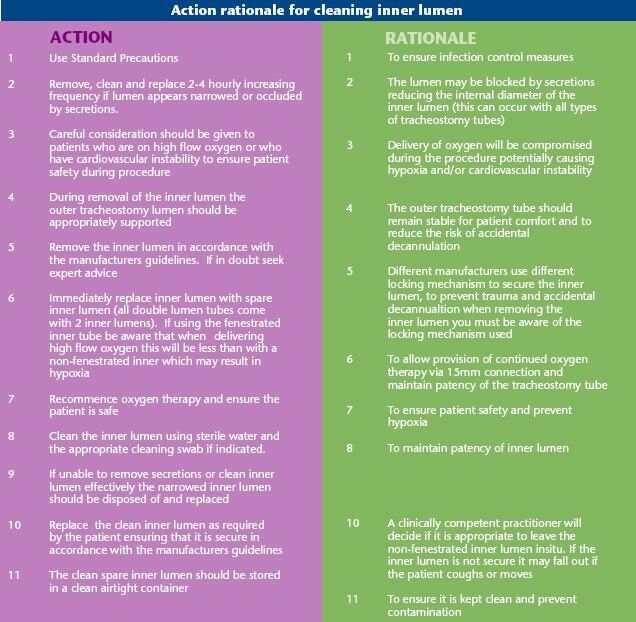 The inner lumen should be cleaned in accordance with the manufacturers’ instructions and Hospital Infection Control Policy which states that sterile water or saline should be used. The spare inner lumen when not in use, must be stored, dry, in a clean airtight container or when appropriate discarded. Some manufacturers’ two piece tube systems do not allow for a permanent 15mm connection when the inner lumen is removed (for cleaning or weaning). During emergency situations replace the inner lumen to facilitate oxygenation, suction, etc.